It is very popular in Southeast Asia. Grow this beauty if you wish to have a constant supply of its sweet fruits that have numerous health benefits. Botanical Name: Manilkara zapota (syn. : Achras zapota, Achras zapotilla, Manilkara achras. 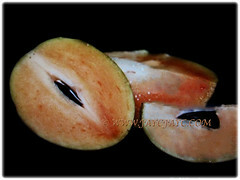 Common Names: Sapodilla, Sapote, Naseberry, Chicle Gum, Chiku in Malay. Origin: Native to South Mexico and Central America. 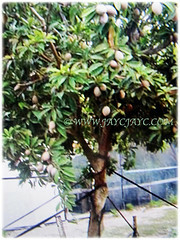 Plant type: A perennial fruit-bearing tree. 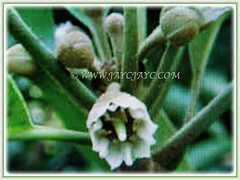 Features: Manilkara zapota is from the genus Manilkara that consists of 85 accepted species. A fairly slow-growing perennial tree that can grow between 18-30 m tall with an average woody trunk diameter of 1.5 m.
However, the average height of cultivated specimens is usually between 9-15 m with a trunk diameter not exceeding 50 cm. It is strong and wind-resistant and the dark brown bark is rich in a white, gummy latex called chicle. 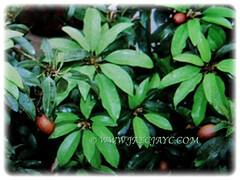 The ornamental and evergreen leaves are medium green and glossy, leathery and thick. The leaves are spirally clustered at the tips of the forked twigs. Leaves with an entire margin are elliptic to ovate, 7-15 cm long and 2.5-4 cm wide. The green bisexual flowers are small, inconspicuous and bell-shaped with 3 inner sepals enclosing the pale-green corolla and 6 stamens. They are polycarpic, solitary and borne on slender stalks at the leaf axils. Eventually, the flowers will be followed by brown, simple and fleshy fruits. Fruits may be nearly round, oblate, oval, ellipsoidal or conical, varying in size from 5-10 cm in width. An unripe fruit is hard to touch and has a firm outer skin and when picked as well as releases white chicle from its stem. 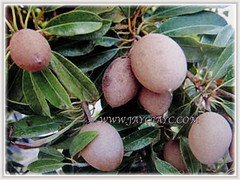 It contains high amounts of saponin which has astringent properties. Though smooth-skinned it is coated with a sandy brown scurf until fully ripe. A fully ripened fruit has saggy skin and does not release chicle when picked. Inside, its flesh ranges from a pale yellow, dark brown, reddish-brown or earthy brown colour with a grainy texture. Each fruit contains one to six seeds that are hard, glossy and black with a hook at one end that can catch in the throat if swallowed. 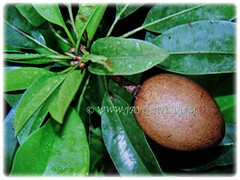 Culture (Care): Manilkara zapota or Sapodilla can be grown easily with least maintenance. Others: Fruits may need to be covered with net to protect them from fruit bats. Once every three months, feed the tree with a 16-16-16 fertiliser to stimulate growth and fruit production. Generally free from serious pests and diseases. Nevertheless, fruits could be attacked by fruit flies, banana-spotting bugs and Phytopthora palmivora fungus. Also, leaves may be affected by rusts, bacterial rot (Septoria sp.) and Rhyparida beetles. 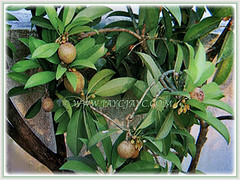 The tree of Manilkara zapota or Sapodilla can only survive in warm, typically tropical environments, dying easily if the temperature drops below freezing. 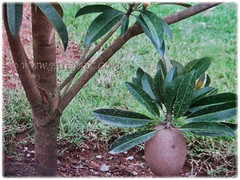 From germination, the Sapodilla tree will usually take anywhere from five to eight years to bear fruit. 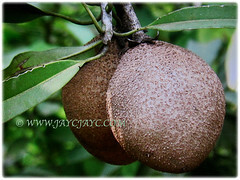 The Sapodilla tree yields fruit twice a year though flowering may continue year round. Propagation: Easily propagated from seeds that germinate between 4-6 days.Alternatively, it can be propagated by grafting, marcotting and air-layering. Seed-grown plants take 5-8 years to bear fruits while air-layered plants take only 2 years to fruit. 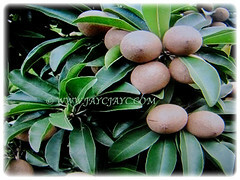 Usage: Manilkara zapota or Sapodilla is loaded with essential vitamins and minerals as well as antioxidants. You can add fresh chiku fruits to smoothies. The fruit is high in fiber and able to bind with fat and eliminates toxin buildup in the gut. It’s instrumental in weight loss and in maintaining healthy digestive tract. Chiku fruits contain high levels of tannins. Tannins protect the body from oxidative stress. What’s more, tannins work to neutralize stomach acids. It helps minimize the chances of erosive gastritis, reflux esophagitis and gastric disorders. Tannins contain powerful anti-viral, anti-bacterial, anti-inflammatory and anti-parasitic properties that cut down the risk of infections and even cancer. In Southeast Asia, chiku is traditionally used to prevent cough and congestion. The fruit is traditionally used as a cough remedy. Chiku skin is also boiled and drank as tea to relieve respiratory problems in children. Lactating mothers are recommended to eat more chiku to help assist in the fetus’ brain development. It also helps overcome morning sickness and dizziness. The diuretic compounds in chiku seeds may treat various kidney and bladder disorders.